Could you carry around your iPad or iPhone instead of cash or credit cards? It seems that the latest rumours circulating around the upcoming iPad 2 is that it may contain an NFC chip. NFC stands for “Near Field Communication” – basically a technology that will allow an electronic device to communicate wirelessly with other electronic devices – yes like RFID, Infrared, Wifi or Bluetooth, but with less range, faster and less complicated setup and compatible with existing RFID. NFC is a technology primarily for mobile phones, and people are hoping that in the future, you could use NFC devices to pay for stuff, validating tickets for concerts, or interactions with electronic posters. So, imagine this – if your iPhone 5 or iPad 2 had an NFC chip, and Coles or Woolies supportd it, and your bank supports it – you could just wave your iPhone or iPad in front of some scanning machine and PAY for your groceries! No cash or card required. Well, to me, it would seem totally impractical to carry around your iPad in your pocket just to pay for groceries. Using your mobile phone seems to make a lot of sense though – I carry mine everywhere. But like many things – Apple are a little behind the ballgame here. It seems that Nokia has already rolled out an NFC enabled phone in 2008 (http://www.engadget.com/2009/04/09/visa-rolls-out-its-first-commercial-nfc-payment-system/). However, with the market share of iPhones and iPads, if Apple picks it up and promotes this, I’m sure most other mobile phone manufacturers will have to follow suit, and this could kickstart new trends. For me, I’m most worried about the safety and security of the system. What happens if you lose your phone? How quickly can you cancel payments from it? Could someone create another NFC device that could steal money from you electronically and wirelessly by just placing it next to your phone/pocket without knowing? If it’s secure and safe, it’d be great to replace EFTPOS with this – imagine paying buying movie tickets online then just passing your phone over some sensor at the movies to get in, or paying for petrol or groceries with your phone? Would you use something like this if it was available and safe and secure? If you’re a geek, you gotta keep up with the big expos around the world. That’s where major product announcements are made and the latest gadgets demo’d. Right now, the MacWorld Expo is being held in San Francisco. This expo used to be the one where Apple officially participated and announced new products but it pulled its support in 2009. Still, many companies selling Apple accessories and software have come out in force. This device called the iFusion caught my eye – converting a mobile phone for use as a deskphone with charging and speakerphone capabilities! Wow! Apple is clever… they seem to have recognised and acknowledged the ease and success of the App Store on the iPhone, iPad, iPodTouch platform and expanded this to their personal computer market. 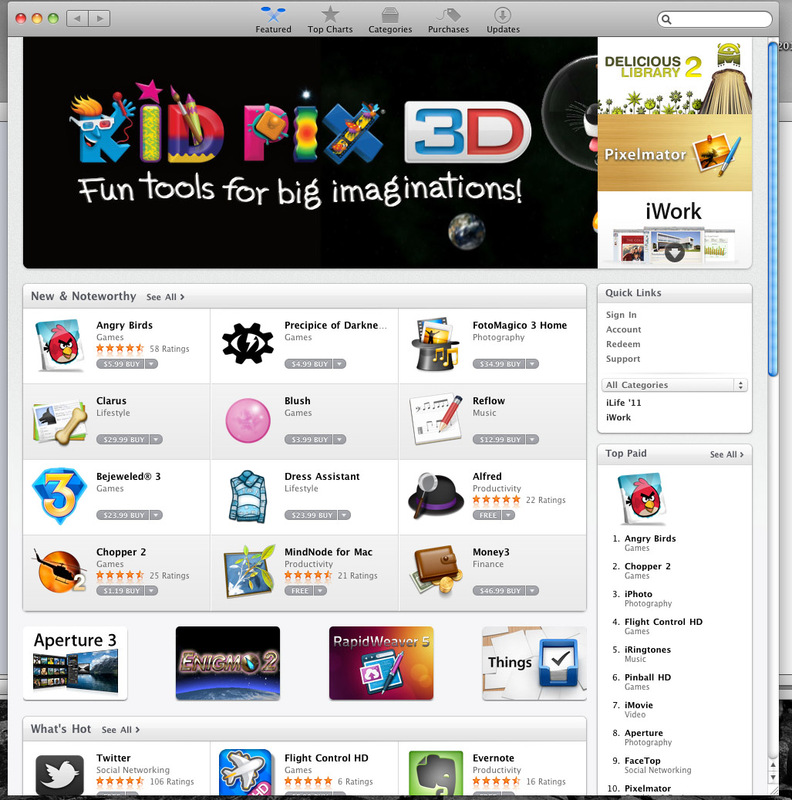 Yep, if you haven’t heard – the latest update of the OSX operating system introduces the App Store to Macs. What a great idea!! I can definitely see myself buying and downloading apps and games, especially if they’re competitively priced. So consumers will now get more out of the Macs. And this will also encourage developers to write more applications and games for Macs since the distribution model is all there – the App Store is just too easy to buy and install a new application or game!! I wonder if this will convert users who have iPhones but Windows computers at home to a Mac too. The first thing I looked up was the new iLife 2011 upgrade. I was thinking – maybe I can upgrade the parts I want, like maybe just iPhoto. So I did some price comparisons between the Australian Apple Store and the AppStore. So, it looks like if you only have 1 Mac at home to upgrade to iLife ’11, it’s cheaper to buy it through the App Store than off the shelf. But if you have more than 1 Mac, it’s already cheaper to buy the Family Pack off the net. But if you don’t need all the new iLife applications for the whole family – for example, if I only wanted to upgrade to iPhoto and no-one else, it’s definitely cheaper to buy it through the App Store. But then I had an idea – one really valuable aspect of the iPhone App Store is that I can buy a game once, and then my family can also install this for free on their iDevices thanks to Home Sharing. I’ve done a bit of Googling but can’t seem to find any mention of Home Sharing for the Mac App Store, which is disappointing. Why should I be able to share Angry Birds between my iPhone, my wife’s iPhone and Little Miss 11’s iPod Touch, but not Angry Birds for the Mac to my wife’s Mac? Apple – any Home Sharing planned? I guess not being part of the iTunes framework might make it technically hard to do this? So how does the purchasing and installation experience work? Just the same as the iPhone platform. After signing in with my App Store account, I clicked the “Free” button for a few of the free applications like EverNote and MindNode. My dock showed them downloading and they just installed seamlessly to my Applications folder. I did notice that downloaded applications seemed to be pinned to the dock by default. Arghh!! Does this have to be the default? I guess it might help the newbie Mum and Dad who wondered where their purchase went, but this could cause a lot of clutter!!!! Actually, on clutter – I think people’s Macs will now get cluttered with useless applications and games! Anyways, I can see my whole weekend taken up by browsing all these apps I never knew existed for the Mac. I expect that it will take a few weeks/months for the App Store rankings to settle down and be more meaningful too. I can’t wait until more commercial and common software is available through the App Store for easy purchasing and/or installation – Adobe, Sibelius, Firefox, Chrome? If you’ve been reading my posts lately, you will have notice I’ve turned into an Apple fan. I just love their design. I was really excited when Perth got its first real Apple store. Awesome!!! No, I didn’t line up to be the first in on opening day, but I did visit it on opening day. And so yesterday when I had a day off with the kids, we went into the city and made a pit stop at the Apple store. Now, recently the mute button broke off my iPhone. I thought that this would be a good opportunity to ask someone for help. So I looked around the store. An army of employees in blue T-shirts. Most of them seemed busy with other customers. Others looking busy behind a Mac. Others seemed to be busy walking from point A to B. Hmm… Who do I approach? There doesn’t seem to be a dedicated general customer service person or location. So I walked up to the counter where you pay for stuff. The dude there was busy and I couldn’t even make eye contact with him. Some other Apple guy came out from the back and talked to him, then walked right past me – I couldn’t even make eye contact with him either! So far, not so good. I would’ve expected one of them to say “Hi”, that they’re busy and will get to me soon. After more waiting and no employee even acknowledging my existence, I had to approach the guy at the counter myself and say, “Hi, I need some help”, explained my mute button is broken and what can I do. “You need to make a Genius appointment”. The guy then proceeds to lead me to a free Mac and tells me that I need to make an appointment on the computer and tries to show me how to do it. Shouldn’t he be engaging me as the customer and booking the appointment for me? ARGH! I only have about 4 months left on my 24 month contract with Optus for my iPhone 3G. I know a few of my friends had been contacted by Optus, asking if they wanted to upgrade to an iPhone 4. But not me!!! So on the weekend, I headed to an Optus store to see what options I had. And amazingly, they had some “special weekend offer” where if I signed up for another contract, they would waive the remaining 4 months of handset payments, as well as early contract termination fees. Sweet! Basically, I keep on paying the “same” amount and get an iPhone 4. Wifey didn’t seem to mind – probably because she can’t wait for me to hand over my iPhone 3G. So, in the end, everyone’s happy. Now just to wait until they get one in stock so I can pick it up. And to find a good plan for Wifey to go on. Upgraded to iPhone iOS 4! Not sure if existing iPhone 3G/3GS owners are aware – but you can upgrade your iPhone to the latest firmware that comes on the new iPhone 4’s. Yep! New features! FOR FREE! And you don’t need to buy an iPhone 4. There’s a whole ream of new small features. But as I have an “old” iPhone 3G, I don’t get the whole lot. Before this update, the only way to create a playlist on the fly was using the On the go playlist. It was definitely not the best way of saving a collection of favourite tunes or tunes you wanted to listen to. At last, now you can create as many custom playlists as you like! But one feature that is missing – the ability to add the currently playing song to a specific playlist. I would have thought that this would be a common use case – you’re listening to a song that you like, then want to add it to a playlist. Aargghhh! I have an iiNet account and a Gmail account both for personal use. Previously on the iPhone I would have to navigate up and down the tree to check emails on both accounts. Now, I don’t have to. Fantastic. Alright – this is a great feature! Hands up who had screens and screens worth of applications? Me! I’ve now re-organised my applications into groups on my first main screen. The result is just 2 clicks to get to my most used applications and games. Yes I hear people complaining that you can’t add more than 12 applications into one group. But hey, if you had more than 12 I don’t think you’d save any extra UI interactions to get to the application you want – you’d need more than 2 clicks/swipes. I’m just struggling with the most suitable way to group the applications. Where should I put Flickr? In an “Internet” group for internet related applications, “Photography” since it’s all about photos, or “Social” since it’s all about sharing and engaging with friends? I started with heaps of folders on my home page, but then realised that I only really used a handful of these applications all the time, and I now introduced two clicks to get to them. So I’ve now re-organised my applications so the most used are directly on the first screen, and folders can flow into the second screen. Yay! Another digital book application to add to my existing Kindle, Borders and Wattpad apps. I spent a whole evening downloading as many free books as I could find thanks to Project Gutenburg – http://www.gutenberg.org/. I was really looking forward to this, just so I can swap between applications quicker. A friend showed me how it works on his iPhone 3GS and it’s really quick to switch apps. Unfortunately for him, he left a GPS application running in the background accidentally and it chewed up nearly all his battery without him realising! Hmmm..
It’s responsive, but hey, it’s just digitally zooming a 2 megapixel picture so the result is quite pixelated, especially at the 5x end of the zoom. I’m sure I would use a little bit of zooming if I can’t actually get closer to the subject I’m taking, but otherwise *yawn*. So first thing I did was upgrade my iTunes, and then proceeded to upgrade the OS on my iPhone. But the first thing iTunes does is backup your phone which took hours! Then it puts on your OS, then puts all the applications back on it. For me, I had to leave this to run overnight – it was just taking too long. And then the next morning when I checked to see how it went, I found that I had lost all my email configuration and emails and contacts! Even my Safari bookmarks were gone. Basically all individual application data was lost. Since upgrading, I’ve found that the UI can be a bit sluggish at times. There was one time when my iPhone got “stuck” in the Phone application and pressing the Home button didn’t even go to the home screen anymore. I decided to upgrade Miss 11’s iPod Touch to the latest firmware, and after that she found that she couldn’t play music anymore! The iPod music application would keep on quitting. A restore of a backup seemed to fix things. So final verdict? Don’t upgrade yet. I’d recommend friends to wait until the next firmware update if possible so that these issues can be ironed out. You may have read that just a few days ago, a technology review website somehow got hold of the not-yet-release iPhone. Don’t know whether this is the real next iPhone or not, but it looks like production quality and certainly has Apple chips inside it. Of course, Apple may have various prototypes flying around and this could be one of many designs. But I’m intrigued (as well as many others on the internet) – is this all just a marketing stunt by Apple? It’s disappointing that Gizmodo didn’t take it apart like what iFixit does (http://www.ifixit.com/Teardown). If it was all planned – what will Apple gain out of this? iPhone 3G and 3GS sales will drop as people will now wait for the iPhone 4. But maybe sales numbers for those were declining anyway? (For example, Wifey is holding out on getting one until the next model comes out). What’s probably more important for Apple is that it may stop people buying competitor’s smart phones for a while. It could sway people to hold off buying other brands for 2 months until this new iPhone comes out. But more importantly, it’s kept Apple in the news, faboys excited and anticipation growing for their latest products…. I can’t wait!